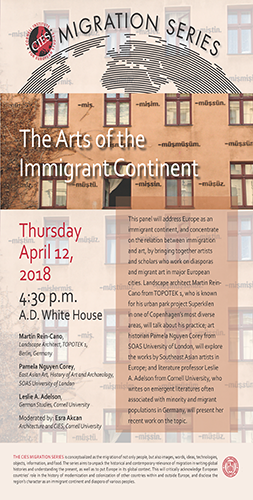 This panel will address Europe as an immigrant continent, and concentrate on the relation between immigration and art, by bringing together artists and scholars who work on diasporas and migrant art in major European cities. Landscape architect Martin Rein-Cano from TOPOTEK 1, who is known for his urban park project Superkilen in one of Copenhagen’s most diverse areas, will talk about his practice; art historian Pamela Nguyen Corey from SOAS University of London, will explore the works by Southeast Asian artists in Europe; and literature professor Leslie A. Adelson from Cornell University, who writes on emergent literatures often associated with minority and migrant populations in Germany, will present her recent work on the topic. The CIES Migration series is conceptualized as the migration of not only people, but also images, words, ideas, technologies, objects, information, and food. The series aims to unpack the historical and contemporary relevance of migration in writing global histories and understanding the present, as well as to put Europe in its global context. This will critically acknowledge European countries’ role in the history of modernization and colonization of other countries within and outside Europe, and disclose the region’s character as an immigrant continent and diaspora of various peoples.